The ease of Chariot has made me wonder if my friend was right: Why should anyone use public services if the private sector can provide the same service more efficiently? On an individual level, after all, the private bus was much more pleasant and not much more expensive. On the government level, privatization could save money. Privatizing public bus services could save $5.7 billion a year, according to a paper published by the National Bureau of Economic Research in March. Many economists would say that giving consumers more options is a good thing. I spoke to Matthew Mitchell, the director of the Project for the Study of American Capitalism at the Mercatus Institute. He argued that public transit is a monopoly. The government gives tax dollars and subsidies to transit agencies, allowing them to exist in environments where other businesses wouldn’t be able to afford to operate. Then the government regulates what non-governmental transportation services can and can’t do, which drives some private options out of business. In the past, government has stepped in when private options began to illuminate how unappealing the public options were. A century ago, when private drivers started to operate jitneys—essentially charging passengers for rides, much like Uber does—government regulated them out of existence. Without jitneys, people were forced to take public transit, a development that led to a flourishing of transportation services. And yet, even with all the subsidies and regulatory help, most public transit systems have trouble staying afloat. New York City’s Metropolitan Transportation Authority, for example, has more than 6 million daily riders and a $15 billion budget, and is still constantly in crisis. Private options such as Chariot and Uber Pool can run without these subsidies (although they are currently running on significant money from venture capitalists). Mitchell would like to see transit become completely privatized, with companies competing with each other to serve different lines, which would, he says, drive prices down. “Why not open up a system to market competition so that there can be a flourishing of all sorts of business models?” he said. When the airlines were deregulated, after all, cheap fares flourished, he said. The city asked people to sketch out their dream lines; here are the results. The private sector has some big advantages when it comes to improving existing infrastructure: It can innovate, using new technology and customer input in ways that government can’t. Government is huge, after all, and can’t experiment with money from venture capitalists to try out new ideas; it has to serve existing customers. This applies to things outside of transit, too. In today’s world, there are start-ups that try to create better schools, better mail delivery, and better loan products than what the government can currently provide. Chariot, specifically, is set up in a way that allows it to maximize profits in a way public transportation can’t: It only operates during commuting hours, and only runs on popular routes. It changes the number of trips its vans make depending on demand, and requires passengers book trips through their smartphones to ensure maximum occupancy. In this way, both Chariot and its customers are enjoying an improved system. The private sector creates some losers, too, though. Chariot doesn’t serve many of the poorer neighborhoods in San Francisco, for example. (A spokesperson for Chariot says its routes are crowdsourced, and thus chosen by its users.) And the service is only accessible to people with smartphones who commute during the morning and evening rush. This means that low-income people, who already have limited access to transit, can’t use the service to get to work as quickly as wealthier people can, even though they are the ones that often need reliable transportation even more, since their work schedules are less flexible. But the private sector doesn’t have to completely replace government services. Sometimes they can work together, says William Eggers, the executive director of the Center for Government Insights at Deloitte, and co-author of TheSolution Revolution, a book about how government and business are working together to solve societal problems. Some governments are embracing efforts by social entrepreneurs to solve problems the government hasn’t figured out, he told me. The city of Helsinki, for example, has an ambitious goal to make car ownership obsolete by 2025. Instead, the city envisions a plan where customers use their smartphones to plan and book both public and private transit. 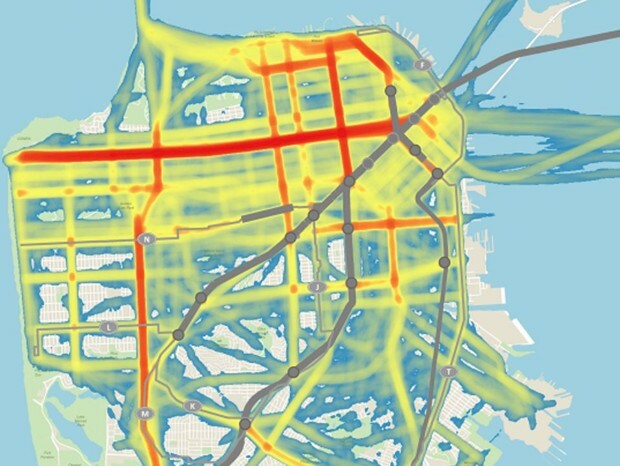 Much as Google maps now shows routes by walking, transit, and services such as Uber, Helsinki’s plan would allow users to look on their smartphones and select whichever mode of transport will get them to their destination in the most quick, cheap, or environmentally-friendly way, depending on their preferences. “The most innovative governments are going to say, ‘We’re going to capitalize on all this innovation, rather than competing,’” Eggers told me. And if there are things that a city has decided it wants to provide—transit service to poor people who might not be able to afford the private options, for example—the government can provide vouchers so that people can choose whatever private option suits them best, Mitchell said. Rather than spending millions to operate multiple transit lines and modes—while losing money—the government can spend less and leave the headaches of running those systems to someone else. It can use the savings to pay for other, essential, government services. This is something cities across America are already experimenting with, contracting with ride-hailing services such as Uber and Lyft to provide rides to disabled people. A Chariot spokesperson told me the company has already met with the San Francisco Municipal Transportation Agency, and that it wants to partner with them to help fill gaps in underserved areas. After all, the company, which was recently purchased by Ford, says that one-fifth of current Chariot trips are to or from public transit stops. A spokesperson for SFMTA says that the agency is open to collaborating with services that can improve its transportation network. But there is a lot to lose by letting private options flourish. Private transit may run the most efficient service, but efficiency isn’t the sole goal of society. Inclusivity is also important, not just for individuals, but for the health of a society overall. Public transit doesn’t just serve those on the popular routes: Most systems use the heavily-traveled, profitable routes to cross-subsidize routes that might lose money due to fewer riders, according to Ian Savage, a transportation economist at Northwestern University. Private transit companies have no good business reason to provide service along routes that will lose money. But that sets up a losing proposition for both public systems and the ridership of less popular routes: Private services might wind up competing with the government along the profitable routes, siphoning money-making customers, and ultimately challenging the government’s ability to subsidize the less-profitable lines. Cutting off commuting options isn’t just annoying, it keeps people stuck in their impoverished neighborhoods and prevents from getting them to the jobs they need to improve their lives. A government that can’t or won’t provide transportation may keep its residents mired in poverty. Private transit may run the most efficient service, but efficiency isn’t the sole goal of society. A world with only private services has other big shortcomings too, namely that the broader population has less say in how these services are run. “There are certain public purposes that can be best served when the institutions are accountable to the public through the medium of elections, and ultimately, through the medium of democracy,” Paul Starr, a Princeton sociologist, told me. When a society comes together and agrees to fund services such as schools and public transit, members of that society get to weigh in on how those entities should be governed. They can elect candidates to the school board or the city council, for instance. This democratic process means residents are engaged in the services that their tax dollars provide, and that they work to improve them, said Jason Henderson, a professor at San Francisco State University, and the author of Street Fight: The Politics of Mobility in San Francisco. There is no such process for private companies, which are governed by independent boards and which exist primarily to make money. This can be problematic when the goals of private companies—usually profit maximization—conflict with the goals of the public sector. The private sector, for instance, may find it’s most efficient to pay workers minimum wage and to not provide health insurance, but that may not be how most people want the employees who serve them to be treated. Perhaps even more important is that when there are private options, the citizens that use them can check out of the democratic process. Parents whose children are in private school are less invested in improving public schools. That has led to tensions between people who can afford to send their children to private schools and who don’t want to pay higher taxes in the name of the public system, and those who can’t. The same happens in transit, too: Once I was using Chariot, I was less interested in the fate of the buses and subways I had been taking every day, and knew less about when there were delays and what was causing them. “It’s a secession from the public realm,” Henderson said. When you start shifting public transit constituents to private operators, “you start to lose the public commitment to the public,” he said. A corollary to Henderson’s argument follows: If I care about where I live, I should patronize government services, rather than private ones. By using services like Chariot, after all, I’m depriving the San Francisco Municipal Transportation Agency of my dollars, and losing interest in a public process that might improve the transportation services I have been avoiding. The government in San Francisco has, so far, largely avoided regulating ride-sharing services like Chariot and Uber Pool the way they did a century ago with jitneys. Without regulation, then, the burden on acting ethically is on me. I can follow Henderson’s suggestions, which include biking to the subway, and then using a bike-sharing system once I arrived closer to my office, or taking the (very long) bus route that runs from my office to my house and advocating for the bus service to be improved. Consumers are faced with ethical consumption choices every day: whether or not to buy local, even if it’s more expensive; or if they should buy a cheap clothing item, even if it may have been made in an overseas factory with poor working conditions. This is more or less the problem facing government services that are now competing with the private sector. It often takes extra time and hassle to choose the “right” thing.